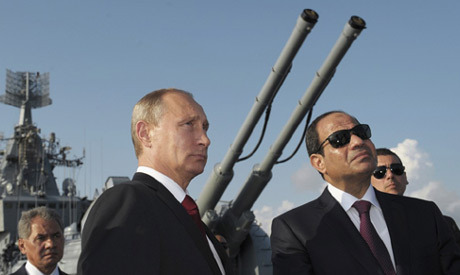 On December 11, Russian President Vladimir Putin visited Cairo and met Egyptian President Abdel Fattah al-Sisi. Putin's visit came just days after US President Donald Trump's official recognition of Jerusalem as the legitimate capital of Israel, which has triggered a new wave of resentment and rage from the Arab world. When commenting on Trump's decision on Jerusalem, Moscow pointed out that this is a unilateral decision outside of the framework of the process of negotiation between Palestinians and Israelis, and does not help to aid the process of negotiation between the parties. Moscow's official position regards West Jerusalem as the capital of Israel and the East as the capital of Palestine. Although Russia's role is limited in mediating the Palestinian-Israeli conflict, it does not in any way diminish the importance of Russian diplomatic and technical support to the Palestinian Authority and government, especially at a time when Trump made the wrong move. Obviously, the recent Trump decision on Jerusalem led to the disqualification of Washington as an intermediary to the process of peaceful settlement, and the tendency is rising for the Arabs to view Moscow as an honest and supportive mediator for a just settlement based on legitimacy and various UN resolutions. This trend is supported by the fact that Moscow was the second sponsor of the peace process in Madrid in 1991, and then a member of the international Quartet formed by the United Nations to advance the settlement process. It has high-level diplomatic cadres and staff and is fully aware of the developments and dimensions of the conflict. There are two major and fundamental interests that determine the pattern of Russian behavior in the Middle East in general and the Arab region in particular: The first is to work on crowding the US out in the region by drawing Washington into debates on more than one arena, one of which is naturally Israel and this stems from the realization of the Russian leadership when the time comes to recalculate the global balance of power. Although Moscow knows perfectly well that it cannot equal US economic or military power any time soon, it can then refuse to remain as a global class II power and insist on the need to reshape the global balance of power. The second is linked to Russia's economic interests in the Middle East. Russia has succeeded in the era of Putin in reconciling the economic objectives of the region, and the above strategic interest. Apart from geopolitical factors driving Russia and Egypt closer, the two countries are deepening their economic ties. Putin's visit to Cairo has witnessed the signing of a $25 billion deal to start work on Egypt's Dabaa nuclear power plant in which Russia aims to help Egypt realize its long-dreamed goal of building its first nuclear power plant. The nuclear power plant agreement is for the construction and operation of four 1,200 MW reactors. The plant will make Egypt the regional leader in the field of nuclear technologies and the only country in the region that will have a generation 3+ plant. The plant in Dabaa will be the largest joint project between Russia and Egypt since the Aswan Dam was set up in 1970, and will become truly a new page in the history of bilateral intergovernmental relations between Russia and Egypt. Furthermore, after nearly two years' suspension of Russian flights to Egypt due to a Russian passenger plane crash in Egypt's Sinai Peninsula in November 2015 caused by a terrorist act, which led to the deaths of 217 Russian tourists and seven crew members aboard, Russian civilian flights to Egypt are scheduled to resume in early February 2018. Russian tourists have been the biggest contributors to Egypt's tourism industry and nearly 3 million Russian tourists visited Egypt in 2014. So there is no doubt that Moscow's flight suspension decision in November 2015 heavily damaged the already struggling Egyptian tourism industry. With the reopening of air links between Russia and Egypt, it is expected that a 10 to 35 percent shift of Russia's tourism traffic will occur from Turkey back to Egypt. According to the competitive pricing policy of Egyptian hotels, Egypt will now be able to compete with Turkey for tourism revenue in the coming summer. The average price of a Turkish hotel is $60-70 per night, but the price of an Egyptian one is just $30 per night, so if a trend for Russians to travel to Egypt is started, there will be an increase in demand for it. Most likely, Egypt will enter into a good tourist season in the first quarter or the first half of 2018. More than 14.7 million tourists visited Egypt in 2010, down to 9.8 million in 2011 and 4.5 million in 2016. Egypt's revenues from tourism were $3.4 billion in 2016. Egypt expects tourism revenues to reach $6 billion by the end of 2017. Russian tourists coming back to Egypt will certainly play a major role in the expected Egyptian tourism industry boom.